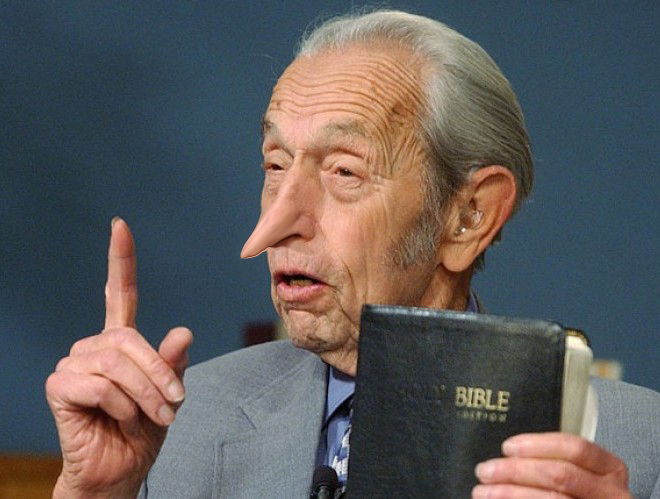 Poor Harold Camping, the whole world has witnessed his fall, and now he must bolster his pride and continue his self-deception or confess and repent. But, let me say this in his defense; he is more honest in his promulgations than the whole camp of liberal Emergents. Harold studied the Bible, in the power of his own mind and reasoning, and boldly stated his conclusions to the world. The liberals, on the other hand, do their studying and then scurry off into shadows, innuendos, insinuation, half-truths, and misrepresentations. These New Age liberal Emergents come to no absolute conclusions. By making no judgments, they can say everything, without saying anything. They have perfected the Luciferian art of “doublespeak” by virtually prefacing all they say with the preamble “Hath God really said,” or as Rob Bell would say “. . . and someone knows this for sure?” Harold did no such thing; he boldly proclaimed his error, in the face of truth; he dared to come against the light in the open, and fell. The liberals lay in ambush with snares and pits, and hide in the fog of deceit. Harold was not really honest by any stretch of the imagination; even still, he was more honest than the Emergents. When Satan initiated the use of Liberal tactics, in the Garden of Eden, he was awarded the title, “Father of all lies,” so what does that make the Emergents? Harold rejected God’s truth and is condemned. The liberal Emergents reject God’s word and are applauded, proving that it is hard to hit a moving target or put fog in a box. At least Harold tried to be honest in his own deceived way. The best way to deceive is to copy Satan, by muddling, diluting, mixing, melding, stretching, bending, thinning, reducing, cutting, adulterating, or prostituting the truth, and never show your hand. Harold showed his hand, and is now clearly a liar and false prophet. You will rarely get a peek at the hand of an Emergent. Emergents love to engage in mind manipulation and ego massage, and appeal to the desires of the flesh, where the subtle effects of leaven can work unnoticed. Who should we be concerned about mostly? Harold was a shooting star, his predictions were confined to a small group of followers, and collateral damage was minimal. On the other hand there are the liberal Emergents, whose infectious disease gnaw on and disintegrate the very foundation of truth. Harold Camping’s teaching is unsound, and needs to be exposed, and was mostly accomplished by his own actions; but the Emerging scourge is a wretched curse by which many a soul will be damned. We love to focus on today’s headlines, and laugh at such foolishness as billboards predicting the return of our Lord, when all the while leprosy is creeping up our legs unnoticed. Satan will keep our eyes on the immediate comic display of a few as the real enemy surrounds the city. Harold Camping is more like a sedative to distract our attention till it is too late, until the last curtain falls on the final act, and the world is carried away in its stupor. Is Mr. Camping's nose really this long????? No Mr. Camping’s nose is normal, but if he doesn’t quit lying it may get as long as Pinocchio’s. Camping is a symptom of an infectious and hideous disease – pre-tribulation rapture, pre-millennial dispensational doctrine. Once on the site – click book store, then religion. There is another infectious disease that is even more prevalent than false prophets, and that is greedy Christians profiting by the Word of God. And, what is even worse, trying to pedal it free on other’s sites, while charging an exasperating price, and besides what you are doing is rude and inconsiderate. Have you ever heard of SPAM. If you are a Christian, you should be ashamed of yourself. You are part of the problem with the body of Christ. Please go sell your “snake oil” somewhere else.